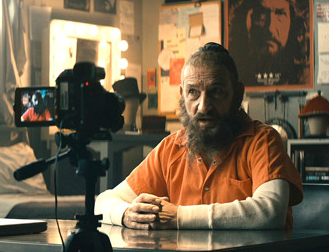 Entertainment Weekly got the goods on the return of Trevor Slattery, now living like a celebrity in prison. The new short, “All Hail the King,” looks to clear a few things up. In what sounds like a split-difference to please both fans and haters of Iron Man 3‘s new take on the Mandarin, it seems that the Ten Rings organization is real, and not necessarily the group we saw controlled by Killian…but there’s no mention of a real Mandarin, which would seem to let Killian’s declaration of “I am the Mandarin!” stand. We’ll also get a look at the cheesy ’80s TV show Slattery used to star in, and see Ben Kingsley’s Sean Connery impersonation. Full details and pictures are over at EW, in a multi-page interview with the short’s director, Drew Pearce. I liked the idea that Killian was behind the Ten Rings in movie one, and thought Yinsen’s appearance at the New Year party backed up that notion (Killian punishing him and Stark), and hate the idea that there’s another Mandarin out there – but I’m not automatically opposed to this. At the very least, I’m happy to see more of Kingsley playing drunk, and possibly doing more bad accents.